From Paris, 2009, when I was following the Tour de France into the city from the Alps. I was so fixated on shooting the Eiffel Tower that I didn’t realize until later, while reviewing my photos, that this couple was somewhat isolated and perfectly positioned to illustrate the scale of this magnificent landmark. You can view more examples of scale in the WordPress Weekly Photo Challenge. That really turned out well. Great shot Kelly. Don’t you love the unexpected ones?! 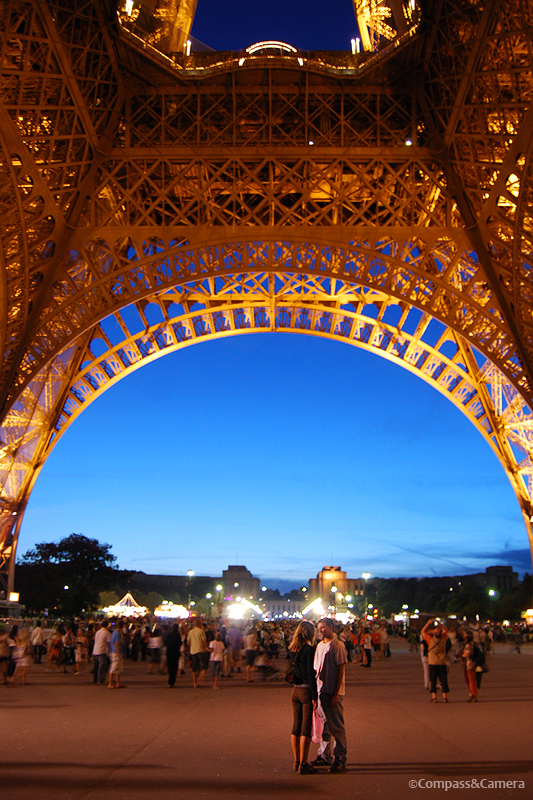 Unless you have been there to visit, it is hard to imagine the size of the Eiffel Tower. Beautiful shot and scale. What a great capture!!!! You are so right. They do show the scale. And the emotion we feel sometimes when we arrive at a place we’ve always wanted to see! Thanks! I’d love to know the two of them were talking about! 🙂 Thanks so much for your comment. You’ve captured the Eiffel Tower in great proportion and scale to the people below. So hard to photo the entire tower, but you’ve found a way to capture a portion that shows its beauty. Thanks, Angel! I got lucky on this one. There was so much going on, outside and inside my head!! So excited to be there! Great shot Kelly – don’t you just love serindipity?! Brilliant shot ~ not sure if there is a better iconic shot of Paris. You have the romance, the Paris night and then framed by the piece of architecture that makes the city famous. Beautiful. Ha, ha…I like this framing/idea so much I may steal it from you should I ever find myself in Paris again 🙂 Cheers to a great week!